I don’t believe any artist has ever captured the scenic beauty of Hallowell and its neighbor, the Kennebec River, as impressively as the late Paul Plumer. Standing atop Lowden Hill and viewing the panoramic view towards Augusta, Paul caught, not only the scene but to the observer, the historic and timelines of long past eras. Looking at art work created dozens of years ago assures that many aspects of the River will remain for future generations to savor. For many years he and his equally talented wife Mary, contributed many paintings and stories in issues of Dirigo, an annual publication produced by the talented pair. Mary wrote for some time for the local Kennebec Journal and her stories in these magazines are another proof of her ability with the pen and pencil. Paul’s art work enhances the stories she wrote as well as those of many Maine writers. Truly, a generous slice of Maine history and happenings of the 1960 and 70 years are captured in those magazines. If you came across an issue today, and it would be your good fortune if you did, there would be both stories and illustration to delight you. Although Paul spent hours in his studio next to the Plumer home, he always welcomed a visitor. I called almost weekly when I knew he was creating a beautiful mural featuring a local family tour through the USA along Route 66. Even the most insignificant sign photographed along the route, is caught by Paul’s pen and boldly accents the highway. The artwork, however, is far more captivating than a photograph could ever be. As with all his undertakings, Paul Plumer never missed a thing such as the location if the owner agreed, etc. In 2007 , Paul was invited to submit a painting that might be included in a nation-wide publication entitled “Strokes of Genius-The Best of Drawings”, a project undertaken by North Lights Books in Ohio. Paul and Mary were delighted when a copy of his work was included in such a prestigious book that would be sold throughout the United States. Paul Plumer was born in Augusta. Early in his youth he knew art would be his life’s work. He studied with art teachers in France, at a noted art center in Los Angeles and gained enough experience to live his dream. When he came home to Maine and lived in Hallowell that talent was his life-work as he had suspected. He expressed many other aspects of his talent with sculpturing and wood carvings displayed in his Warren Street Studio and in many private art galleries. Historians write words that capture events of their era. Artists do the same with paint, watercolors and oils. 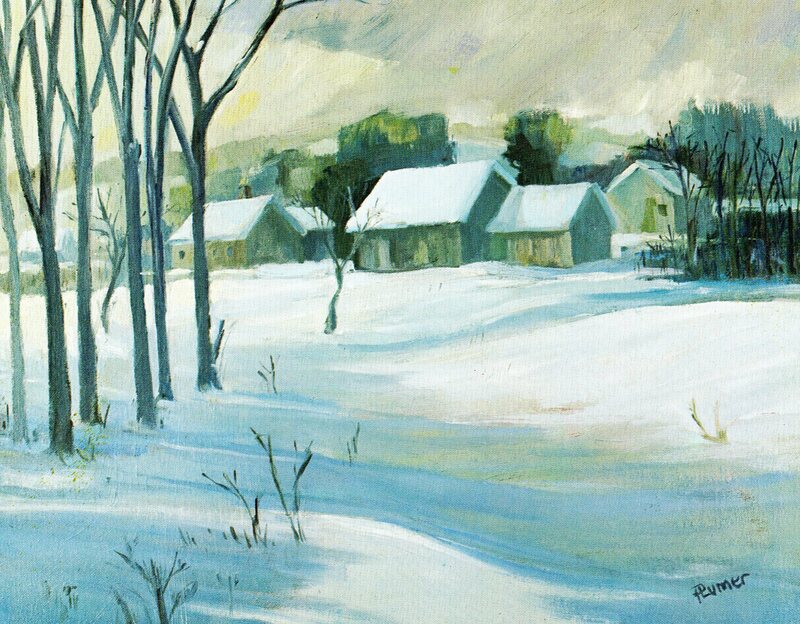 Beyond painting the natural beauty of the area, Paul painted scenes depicting daily life of the 1990’s. These paintings preserve a slice of life for today’s citizens and future generations, and all will be long treasured.